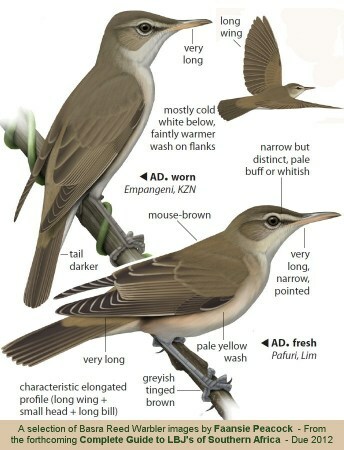 The Basra Reed Warbler - Is this rare migrant now tickable in Southern Africa ? 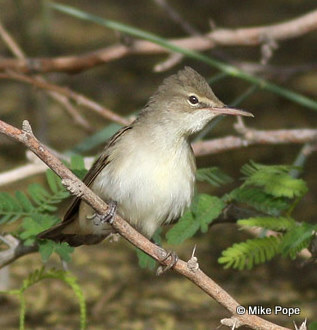 The Basra Reed-Warbler - Is this middle-eastern "mega" now tickable in Southern Africa? The Basra Reed-Warbler (Acrocephalus griseldis) is one of the rarest migrants to Southern Africa, with just a handful of records over the last 20 years. The species is listed as "Endangered" by the IUCN, due mainly to the fact that it's breeding habitat is very restricted and has suffered a massive decline over the last few decades. The Basra Reed-Warbler breeds in the Mesopotamian marshes of south-east Iraq and possibly also in south-western Iran. While it may still be common in suitable breeding habitat, there has been a catastrophic loss of the shallow, marshy wetland habitat the species requires since the 1950s. At present it is estimated that the area of remaining suitable habitat is just 759 km2 - just 7% of the original marshland area in the Middle-East. Ringing records from East Africa suggest that the species has declined by about 20% per decade since the 1970's. However all is not lost and in in 2006 it was found breeding in Israel for the first time. Some surveys have indicated that with the stabilisation of some marshland areas in Iraq, there may be a limited recovery of the population. This last summer, Jono Francis (of Douglas and Francis Safaris) reported finding a significant number of Basra Reed Warblers in the Lukanga Swamps in the central province of Zambia. Based on the handfull of records for the region, the species is a rare vagrant in South Africa itself, where localities include Pafuri, Empangeni, Mapungubwe and Richard's Bay. It is however more common as one goes northwards and old records from several decades ago suggest that the Zambezi Basin may be a favoured wintering area. In particular there are quite a number of records from southern tip of Malawi - Which is close to the lower Zambezi basin and Caia. Malcolm Wilson reports that they are regularly ringed near the coast in northern Mozambique (near Pemba). 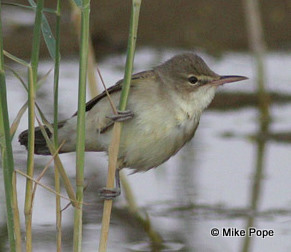 In January I encountered a Basra Reed Warbler at Caia, on the Zambezi. The bird proved very difficult to see in the low scrubby vegetation fringing the marsh, and no satisfactory views were obtained. In March 2011, while leading a birding tour to Mozambique, we encountered a single Basra Reed Warbler in the reedbeds of wide river some 100km north of Gorongosa. The bird was picked up on sight first, and the rather cold plumage, large size combined with very long slender bill suggested Basra. On playing a recording, it immediately started singing and despite the noisy passage of pedestrians on the bridge we succeeded in recording a diagnostic section of song. You can download the recording (mp3) .........here: I am sure that the Basra Reed Warbler is now more regular and common in the central Mozambique area than currently appreciated. In both cases it was found in extensive reedy marshes interspersed with bushy patches, and was alongside Great Reed Warbler. Any information on records from this region would be most welcome. Click on the image on the left for a full size version of Faansie Peacock's superb illustrations ! Thanks to Mike Pope for permission to use the images shown here .....check out his great Kuwaiti Birding Blog here. 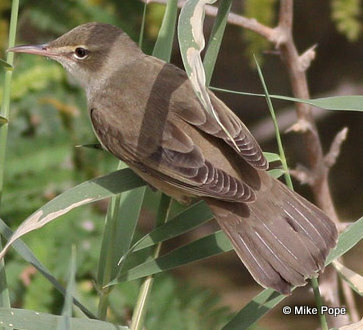 BBC Video of Basra Reed Warbler in the Iraqi Marshes.